The God of Thunder’s third outing is as action-packed as it is funny – and easily the best Thor yet. When I first saw the 80’s inspired Thor: Ragnarok trailer, I didn’t know what to make of it as I’m sure most who saw it felt the same. I had to admit it looked funny and fun though, and after seeing it in theaters, it lives up to that and then some. It’s one of those crazy comic book movies that’s just as funny as it is action-packed and violent, and is quite possibly the greatest of the three Thor films thus far. Jumping into the plot, Thor (Chris Hemsworth) is busy saving Asgard from Ragnarok, aka the end of the world from happening by locking away the fire demon Sutur’s crown. Not long afterwards, he learns that Loki (Tom Hiddleston) is still alive and has disguised himself as Odin while sending the real Odin (Anthony Hopkins) off somewhere on Earth. 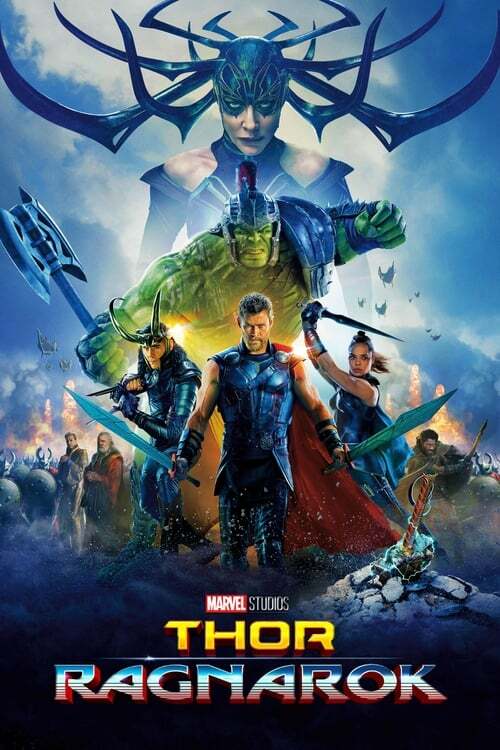 The two team up to find their father with the help of a cameo appearance from Doctor Strange (Benedict Cumberbatch), and also learn that Thor has a sister named Hela (played wonderfully by an unrecognizable Cate Blanchett) that’s the goddess of death and is set to return for revenge on Odin for banishing her away. Like most villains, she also wishes to take over Asgard and remake the people and city to be more like herself…bloodthirsty and ready to rule all of the realms out there instead of only nine. Before Thor and Loki have a chance to stop her, she destroys Thor’s hammer and banishes the two away on a far off planet ran by the Grandmaster (played by the always cool Jeff Goldblum) who enjoys matching up fighters for gladiator-like battles in his arena. In order to escape this planet and save Asgard, he’ll have to fight and defeat the current champion, which so happens to be the Hulk (Mark Ruffalo) that’s grown a little smarter since last we saw him and can talk a bit on top of that. Throw in a Valkyrie turned scavenger (Tessa Thompson) into the mix that also happens to be the one that brought Thor to the Grandmaster, and it falls to her, Thor, the Hulk, and possibly Loki to join forces and escape to save Asgard or fall trying. Director Taika Waititi is a wild and funny guy, and it shows in this equally wild and funny film. The trailers try to sell it as a comedy, and for the most part it is. But don’t get it twisted, as there’s just as much violence and death in it as there are laughs, which gives the film a sort of Deadpool meets Guardians of the Galaxy kind of vibe. I really enjoyed the characters, especially the chemistry Hemsworth and Ruffalo have together, whether it’s Thor with Hulk or as Bruce Banner. It was nice to see Ruffalo as both the Hulk and Banner, as we finally get to see just how fun he makes both characters this time around. Jeff Goldblum was as fun and funny as ever, but I have to say the character that’s really going to grab people is the rock-like being named Korg, who is voiced by director Taika Waititi. He looks scary and intimidating at first, but then you find out he’s the most laid back, New Zealand-accent having guy around. His laid back and nonchalant attitude is easily one of the most fun and funny things about the movie. I was also pleasantly surprised to see Karl Urban as Skurge, who acts like a sort of second-in-command to Hela, but doesn’t really want to hurt any of the Asgardians. Another fun surprise was seeing Idris Elba literally cut loose as Heimdall, who has forsaken his stiff armor for a dusty cloak and tunic paired with his huge, two-handed sword that he uses to protect Asgard. I could go on and on about how I enjoyed the movie, and the awesome music by Mark Mothersbaugh of Devo fame that gives the film a typical scary sounding soundtrack at first, but then transforms it into a fun, retro-synth soundtrack later on. But in the end, if you love the Marvel movies, Thor, or just fun action flicks, you owe it to yourself to grab your cape and hammer, and soar on over to theaters to see Thor: Ragnarok, as it’s a wild and trippy ride from start to finish.